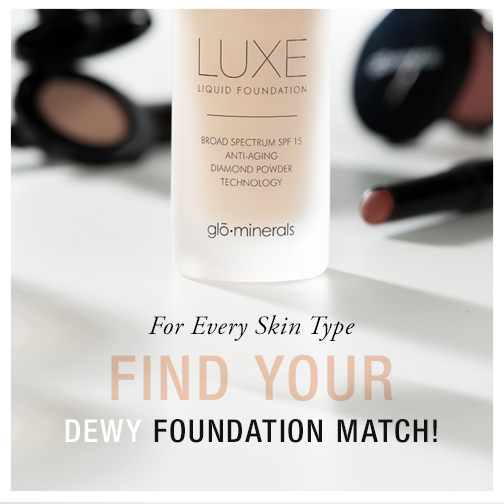 For dry and flaky skin, Glominerals Luxe Liquid Foundation SPF 15 is a must! With its built-in specialized moisturizing agents, and medium dewy finish, your skin is left looking flawless, hydrated and luminescent! For normal to dry skin add a natural, sheer glow by applying an even layer of Glominerals Sheer Tint Base. If more coverage is desired, let the first layer set, and continue with a second application for a beautiful dewy finish! Normal to oily skin requires a formula that will help to reduce shine. Loose Base is our top pick here and provides a customized coverage level of your choice. To set this foundation, be sure to give your skin a spritz of Glominerals Moist Hydration Mist to achieve that added dewy glow. For oily skin take caution! Always keep your Glowminerals Matte Finishing Powder on hand to touch up your T-Zone!